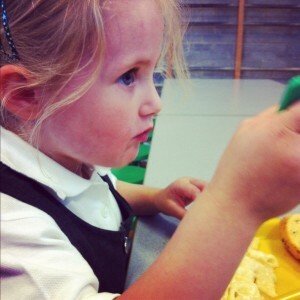 When I became a SAHM I thought I would be freeing up some time, especially as the change coincided nicely with Tilly starting school. I mean, when Tilly was at pre-school and I was on maternity leave I never seemed to have any time to do much cooking, cleaning etc. but surely that was because I was up and down all day with the school and nursery runs. Tomorrow is my first week where both big kids will be in school full-time – only one drop-off and one pick-up, bliss! I would like to say that I will be ensuring that my house is sparkling (and not just because someone has tipped glitter all over the floor) and that the piles of clean clothes (I got that far last week!) will actually be put away but I can’t really. So far the week is shaping up to be a social whirr of lunch, groups, more lunch and then on Friday, a day off (which I’ll probably spend slumped in a heap)… Work would be a break at this point (although lunch there wasn’t half as good as the Turkish place I’m going tomorrow). This entry was posted in Bits and bobs and tagged baby group, busy, sahm by twigletmac. Bookmark the permalink.